We held our first regular meeting of the new year at Tokyo volunteer center on 7th January 2017. He performed as storyteller in introduction and delivered the historical speech about the Bright "Penelope" introducing the words "Mentor" and "Tutor". She gave us the points of coaching to inspire the achievement of the goal, picking up the hot issue in our club with role playing. It was full of joy and tips. He delivered powerful message "Go forward even though we hesitate" , inspiring the audience with his personal episodes, visual aid and humor. 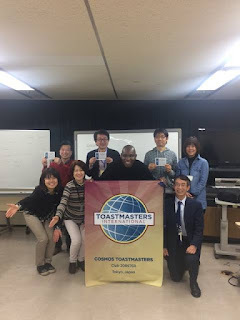 In this time we had seasonal topics, phenomenal speeches, comments, and evaluations. We'll have the next meeting on 21st January.